“The doubling of our presence on the IR Top 500 is a great advance and clearly demonstrates the ability of Magento products to scale to support merchants doing hundreds of millions of dollars in online revenue,” says Roy Rubin, Co-Founder and COO of Magento. Magento products are now the top platforms for midmarket merchants—defined by Internet Retailer as those with $20M-$75M in annual online sales. 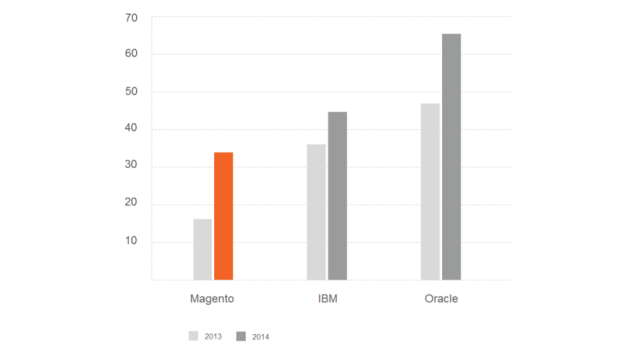 Magento grew from 13 midmarket merchants on the list in 2013 to 24 in 2014, overtaking Oracle in the top spot in this segment. Together with eBay Enterprise’s Enterprise Commerce Platform, eBay-owned platforms combined have extended their lead as the top provider to midmarket merchants. 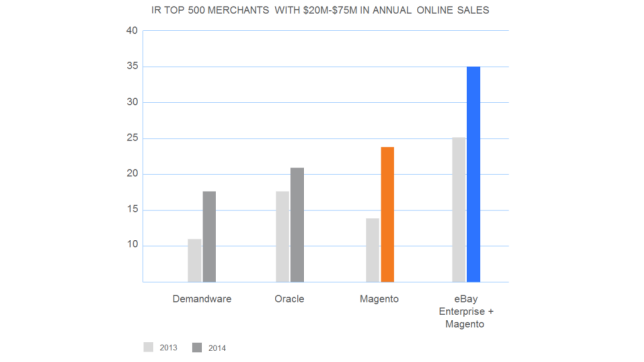 With 57 total merchants, the two platforms combined put eBay Enterprise second only to Oracle on the 2014 IR Top 500.